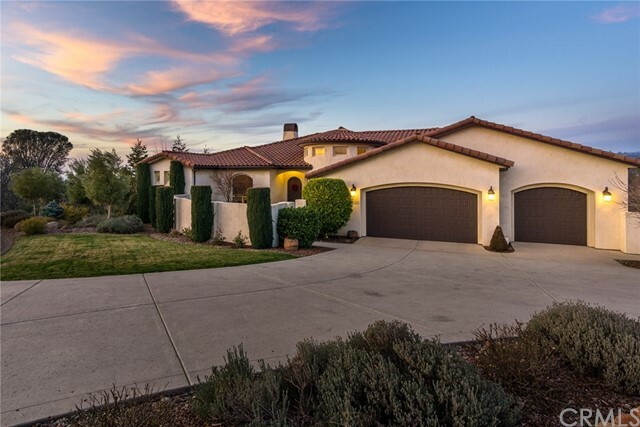 Absolutely STUNNING Mediterranean style home, located in Canyon Oaks! Exquisite elegance inside,peaceful serenity outside. This home boasts 4 bds, 3.5 bathrooms, sep living room, family room, formal dining room, and a bonus room with a wet bar and a half bath. Enter through the private front courtyard and you will notice the extras throughout the home such as arched doorways, rounded corners, large baseboards, upgraded tile flooring and carpeting, custom lighting and fans, built in cabinets and art nooks with lighting. This home also has an oversized indoor laundry room, power blinds, HVAC, and a whole house fan. The kitchen is designed with upgraded granite counters and backsplash, custom spice rack, deep sliding drawers for pots and pans, and upgraded appliances. The master suite is privately located on one side of the house, and the gorgeous master bath has a sep tub/shower, dual sinks, vanity, and a fantastic walk in closet. Next, take a step outside into this private, remarkable backyard. The back covered patio is your front row seating to watch the sunsets. Walk down the steps and you'll find a beautiful salt water pool, an outdoor kitchen with granite counters, fan, lighting, speakers, and custom rock walls and matching pergola. The oversized side yard can be used as a dog run, and there is extensive storage underneath the house. The 3 car garage has an extra nook for golf cart parking and includes custom cabinets and work bench. This is a MUST SEE! !